In spite of their pleasant temperament and hardy nature -- both of which make them good pets -- bearded dragons can be challenging to house. Though a few commercial caging options exist, many keepers build their own custom cages by repurposing a stock tank. Once fitted with a suitable lid, appropriate lights and the proper substrate and cage furniture, a stock tank makes an excellent vivarium for your bearded dragon. Because of the size that bearded dragons (Pogona vitticeps) eventually attain and the level of activity they engage in, it is important to provide your pet with an appropriately large cage. As a minimum, each adult requires between 4 and 8 square feet of floor space. Aquariums of that size are expensive, heavy and fragile; however, the containers used to provide water to livestock -- typically called stock tanks or horse troughs -- are affordable and durable. A 4-foot long stock tank that is 2 feet wide will house a pair, though a trio requires a 6-foot-long cage. Though stock tanks are not as aesthetically pleasing as aquariums, by creatively decorating the outside of the trough you can keep the cage from being an eyesore. Even though your bearded dragon is not likely to climb out of a trough, provide a lid to keep unauthorized hands and other pets out of your bearded’s habitat. Additionally, the lid will help to prevent the heat from escaping from the cage as quickly. You can make the lid out of solid wood or plastic, but it is possible to make a frame and screen lid as well. In all cases, the lid must allow adequate ventilation. In most cases, the best way to suspend your bearded’s heating and lighting fixtures is by cutting out sections of the lid, and covering the holes with metal mesh -- the lights then rest on top of the mesh. If you make the center of the lid hinged, it will allow you to open half of the lid to access the cage, without having to remove the lightbulbs. Bearded dragons bask in the sun to warm their bodies and in doing so also absorb ultraviolet light, which helps them to metabolize their dietary calcium. In captivity, you must provide a heating and lighting system that provides suitable warmth and ultraviolet light. An incandescent bulb placed in a reflector dome makes a good heat light. Place it at one end of the enclosure to establish a thermal gradient; this allows your lizard to warm up and cool off as he wishes. Adjust the bulbs wattage until the surface temperatures directly under the light are between 100 and 110 degrees Fahrenheit. Next to the basking light, place a full-spectrum fluorescent light bulb that provides 3 to 10 percent of its light in the UVB portion of the spectrum. Give your bearded dragon about 12 hours of light, and 12 hours of darkness. Though each have their own pros and cons, cypress mulch, sand and newspaper are appropriate substrates for bearded dragons. Whichever one you choose, be sure to clean it daily to prevent your bearded dragon from becoming ill. Bearded dragons are semi-arboreal, and appreciate stacked stones or flat branches in their cage -- particularly under the basking spot. 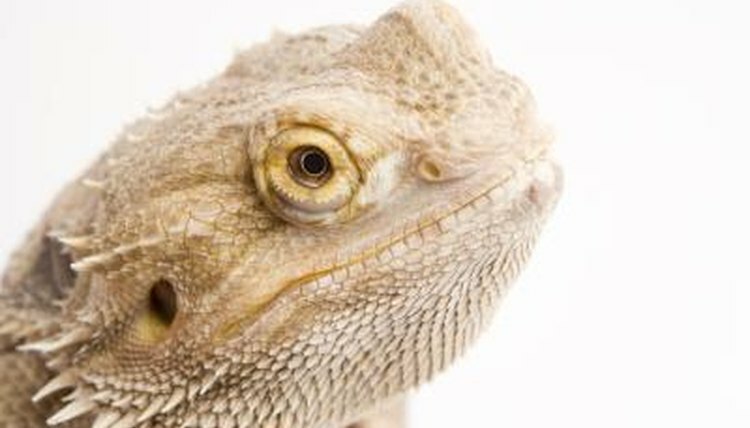 Do not incorporate plastic or toxic plants as your bearded dragons may try to consume them.